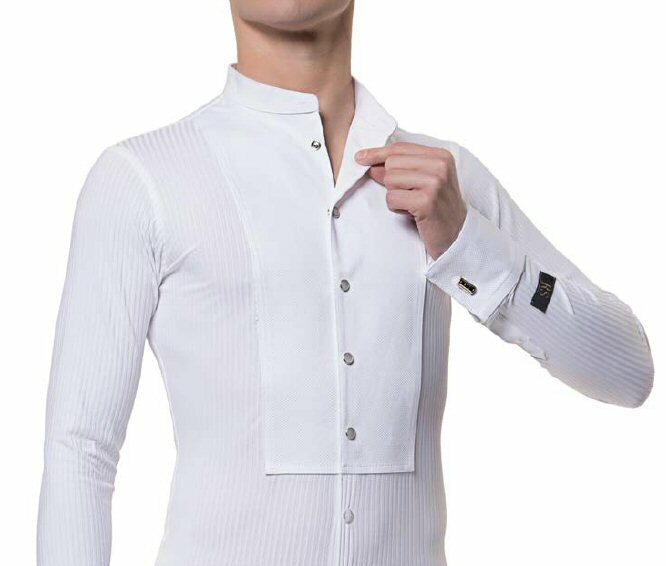 Daniele is a shirt built on a body, so it will never pull out from your trousers. Stretchy body. Available Black or White. 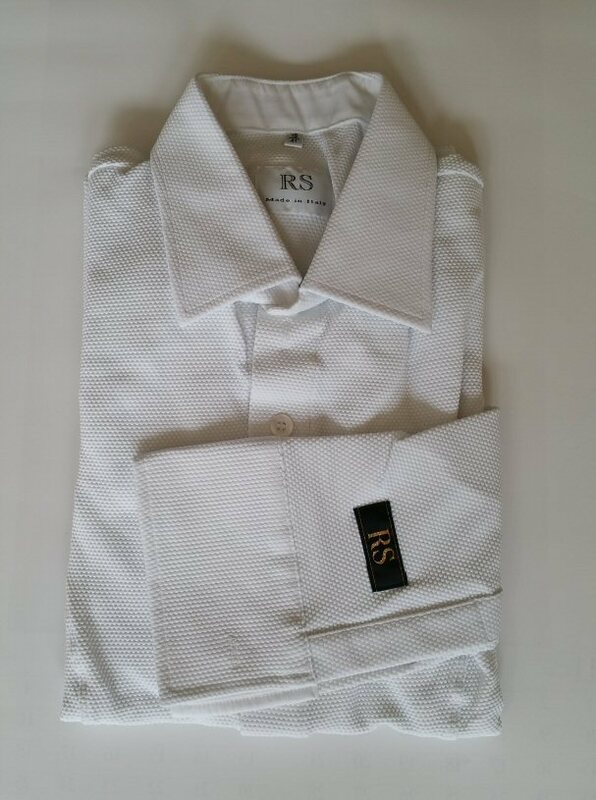 The shirt comes in 5 collar sizes from 15 inch to 17 inch. 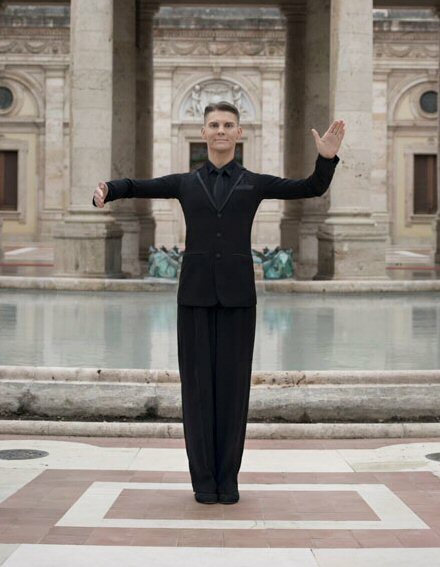 Daniele shirt is shown with Walter waistcoat (waistcoat not included). The chest size goes in proportion with collar size. Classic mens black silk tie perfectly made. Width 2.75" in the widest place. One size only. This is a version of Daniele shirt cut with a special tight fit, so it is suitable for men with slim to medium body. For larger bodies it is better to buy Daniele shirt (above). Stretchy, built on a body. Available Black or White. 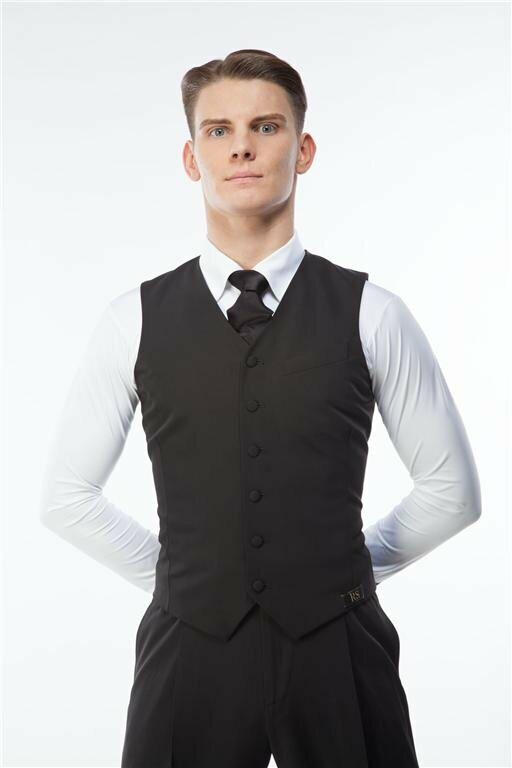 Special tight shirt is shown with Walter waistcoat (waistcoat not included). 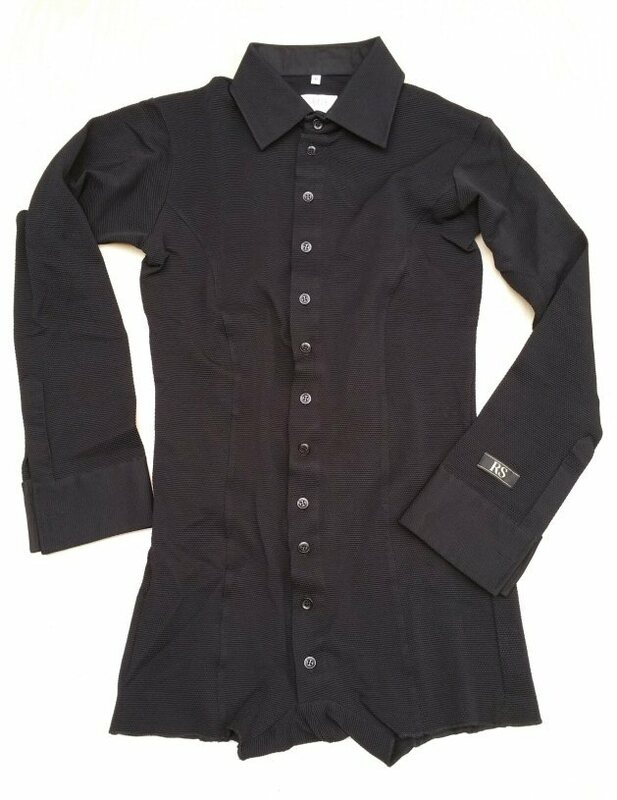 This is the same Special tight fit shirt as above, but made in a thicker, textured S.M.I. fabric. Also stretchy. Classic mens black silk tie perfectly made. Width 2.75" in the widest place. One size only. The model is wearing also Daniele shirt. 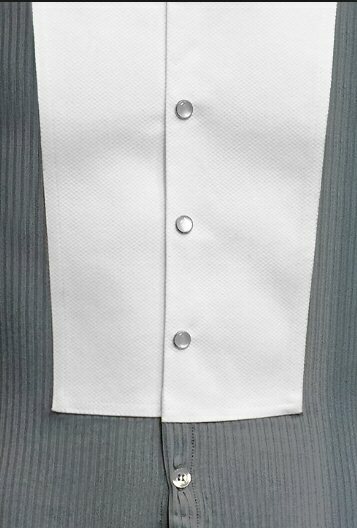 Walter waistcoat is shown with Daniele stretch shirt (shirt not included). The manufacturer's recommended sizing is very generous, if you are anywhere in between sizes we recommend taking the smaller one! 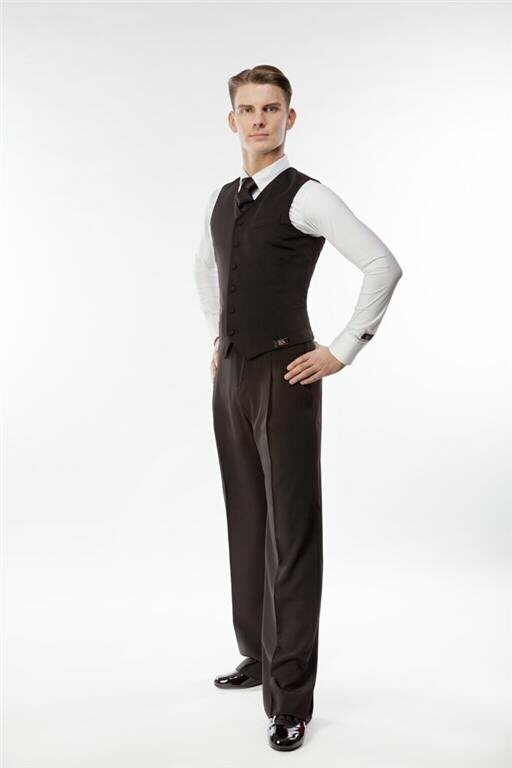 Jonathan is a longer version of the ballroom waistcoat beautifully made and fully lined. Plain black only. 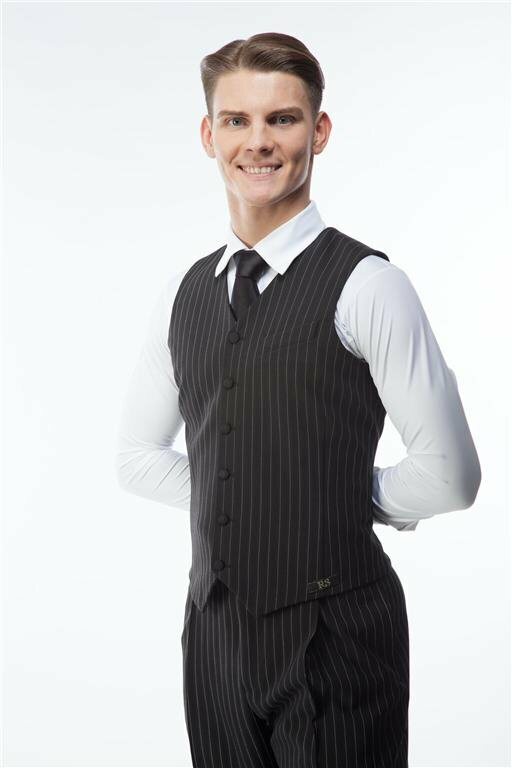 Jonathan long waistcoat is shown with Daniele stretch shirt (shirt not included). 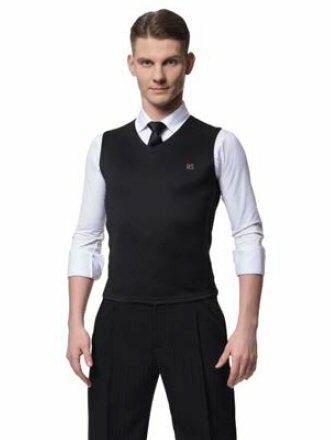 Vittorio knitwear waistcoat is more comfortable to wear for a practice. Vittorio knitwear waistcoat is shown with Daniele stretch shirt (shirt not included). 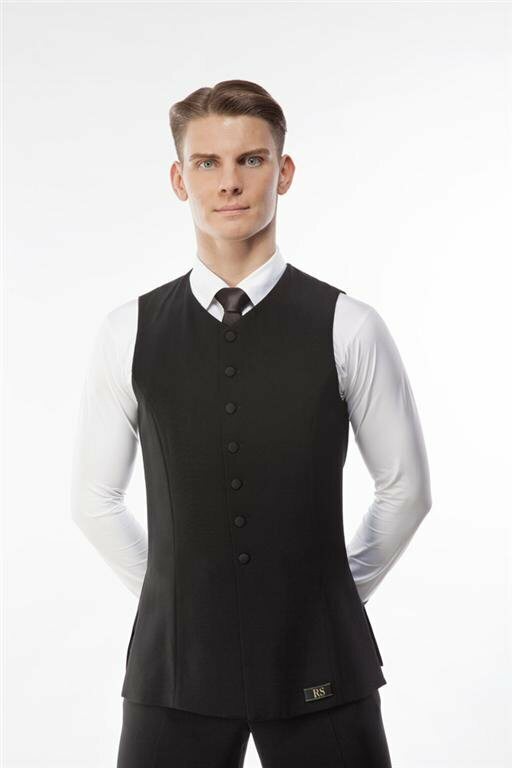 Dmitry waistcoat is stretchy and has special elasticated ventilation fabric on both sides to keep your body cool. It will stretch by up to 4 inch / 10cm in each size. 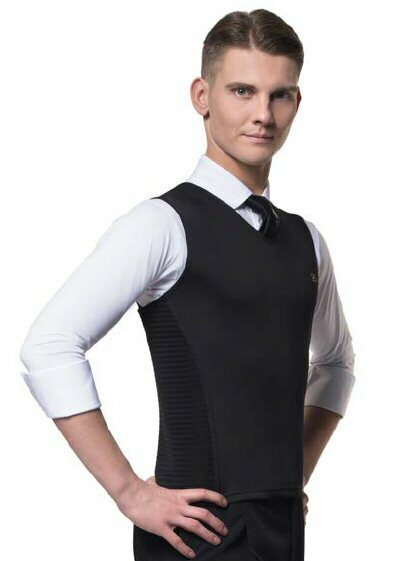 Dmitry waistcoat is shown with Special tight shirt (shirt not included). 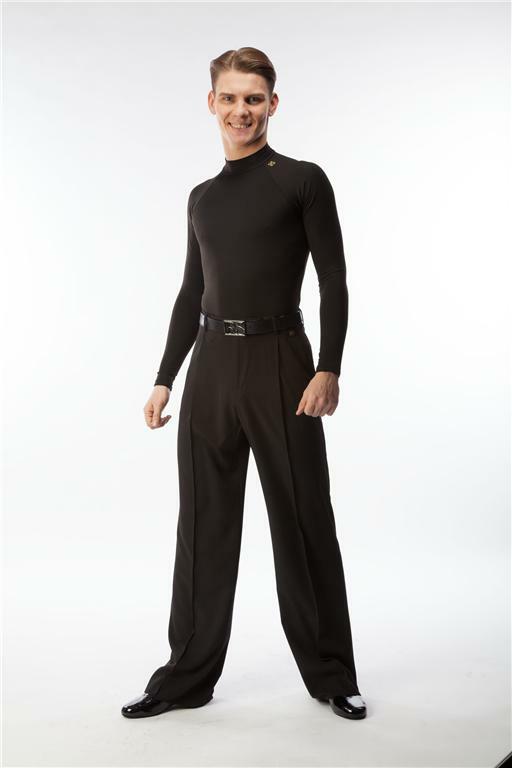 Lorenzo Classic ballroom trousers are a great choice for a smart ballroom practice or even a night out. Being a classic Ballroom cut they are quite wide in the upper leg. Lorenzo trousers come with pleats, two handy pockets and belt loops. The trousers come unfinished at hem, so you can adjust them to the perfect length yourself. Lorenzo Trendy trousers a version of Lorenzo trosuers made in Black with subtle Black stripe. 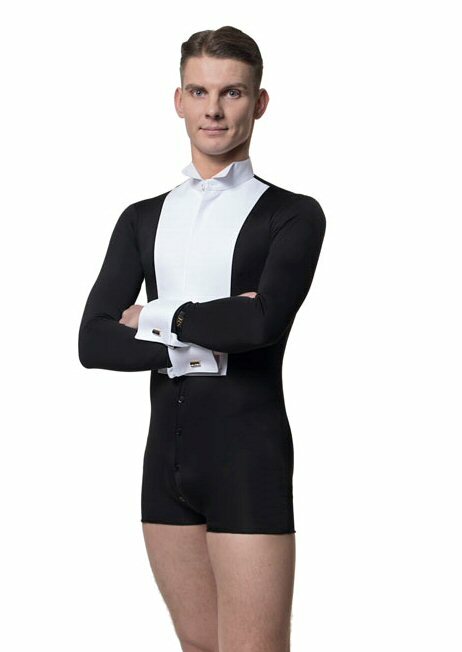 A great choice for a smart ballroom practice or even a night out. Being a classic Ballroom cut they are quite wide in the upper leg. Lorenzo trousers come with pleats, two handy pockets and belt loops. The trousers come unfinished at hem, so you can adjust them to the perfect length yourself. 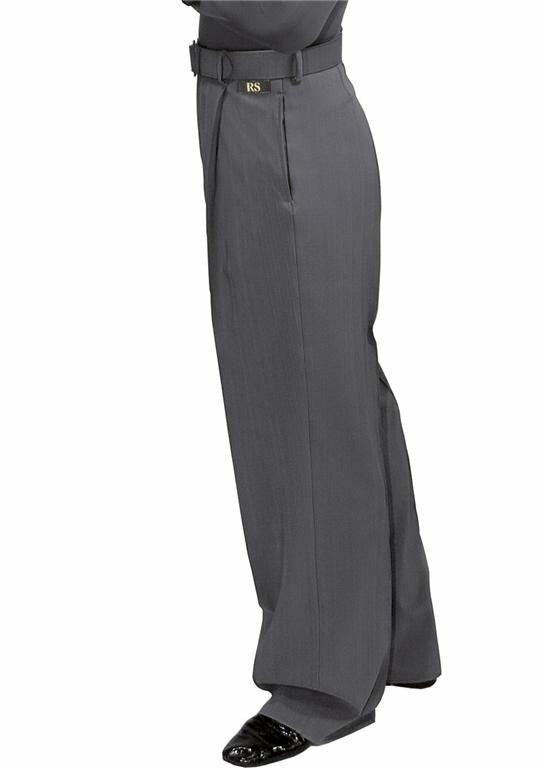 Lorenzo London trousers a version of Lorenzo trosuers made in Grey with subtle Grey stripe. 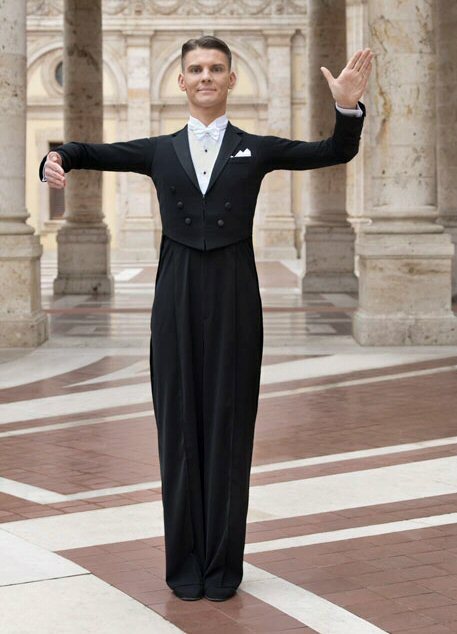 A great choice for a smart ballroom practice or even a night out. Being a classic Ballroom cut they are quite wide in the upper leg. Lorenzo trousers come with pleats, two handy pockets and belt loops. The trousers come unfinished at hem, so you can adjust them to the perfect length yourself. 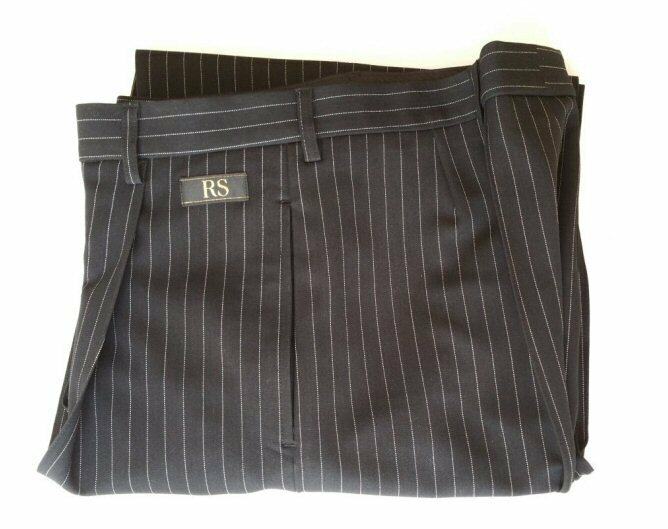 Lorenzo Fashion is a version of Lorenzo trosuers made in Black with subtle White Pinstripe. 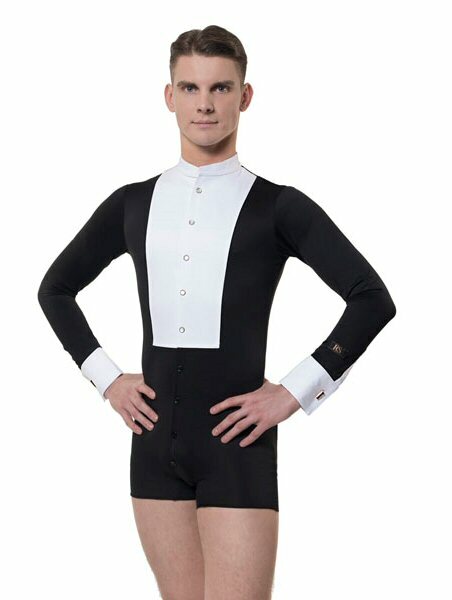 A great choice for a smart ballroom practice or even a night out. Being a classic Ballroom cut they are quite wide in the upper leg. Lorenzo trousers come with pleats, two handy pockets and belt loops. The trousers come unfinished at hem, so you can adjust them to the perfect length yourself. 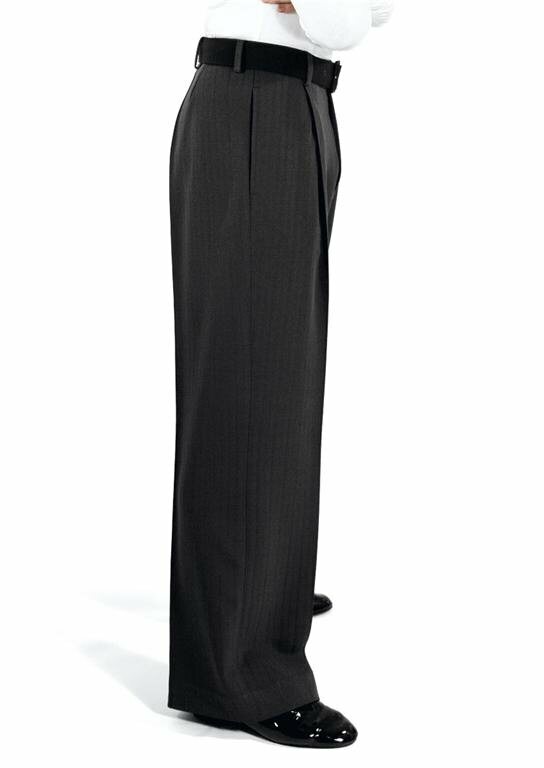 Carlo Smooth trousers are similar to Lorenzo classic trousers, but are wider in the hips and thigh and have no pleats. They come unfinished at hem, so you can adjust them to the perfect length yourself. 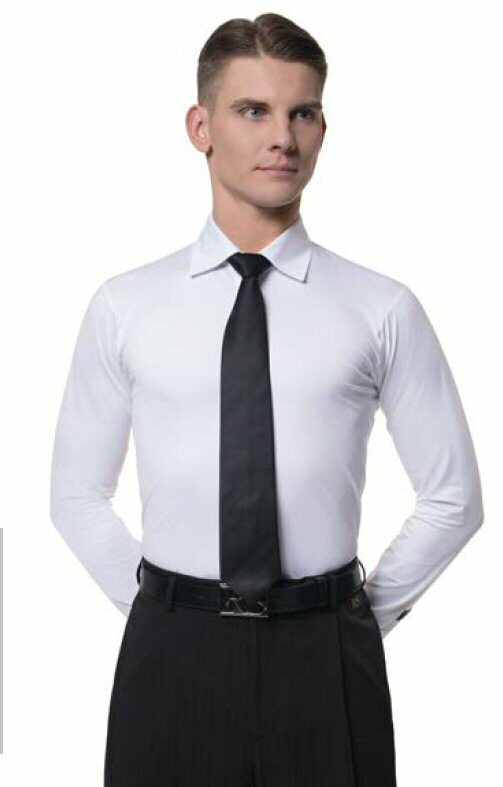 Nero shirt is designed to be worn with a tailsuit. Built on shorts it is a competition shirt with buttons attached to the shirt, so you are never in danger of losing them. Collar not included. You need to buy a collar separately. Very stretchy. White and Grey are made with strap texture fabric, Black has no strap texture. All 3 colour versions come with the classic white front. Size 14" collar only available in White and Black version (not made in Grey). Milord shirt is designed to be worn with a tailsuit. Built on shorts, it is more stretchy than Nero. Collar (width 4cm) is included, so you do not need to buy a separate plastic or cotton collar. Buttons are also included, so you do not have to buy separate dress studs. You will only need to buy a bow tie separately. Milord shirt is available in White stripe / White or Black (no stripe)/White. (The front part is always white). Collar sizes from 15 inch to 17 inch. Frak Tailsuit is made to order to your sizing. Please enquire. Clark Show suit is made to order to your sizing. Please enquire.